Emma grew up in Haywards Heath, West Sussex. After a stint au pairing in Paris and some half-hearted attempts to backpack across Europe, she did a degree in English and got a job as a journalist on a trade paper, then started writing articles for national newspapers on everything from making compost to family holidays in Sweden. Her first foray into fiction was a picture book called Rainy Day, published by Transworld. Emma also wrote a number of books for schools about things like death and stress and drug abuse. She is addicted to intriguing stories – whether in books or on TV or the big screen – and that feeling of desperately needing to know what’s going on or what happens next. 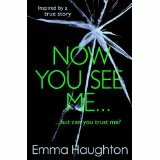 Find Emma on Twitter @Emma_Haughton or at www.emmahaughton.com. 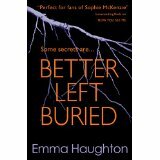 Better Left Buried: Brother dead…best friend missing…house ransacked…stalked by a stranger…attacked in the street…And Sarah has no idea why. She never knew her brother was hiding a dark secret when he died. But now his actions have led the wolves to her door – and the only way out is to run. Now You See Me: Three years ago, Hannah’s best friend Danny vanished without trace. Not knowing if he’s alive or dead, she struggles to move on with a life shrouded in secrets and suspicions… But as hope returns to haunt Danny’s family and their desperation is used against them, can Hannah bear to expose the painful truth? Or is it better to live in the dark?